Web development is a dynamic, rewarding profession. Web developers constantly face challenges, most of which they welcome. There are some challenges however they would prefer to do without. Having to devote excessive time to necessary but repetitive tasks is one of them. Not having the best tools on hand to easily tackle certain technical issues is another. Fortunately, there are tools and services available to help individual developers or teams. These can help them either work through these challenges or avoid them completely. The solutions presented here are just what you need. They are based on site rankings, user reviews, and the overall value they offer or provide. When it’s necessary to track and manage every aspect of a team’s work, which is always the case for large or complex projects, the best solution is typically a visual one and one that resides on a single, centralized platform. That’s precisely what monday.com offers. This visual team management tool is amazingly easy to work with, it’s equally suitable for teams of 2 or 3 or teams of 2 or 3 thousand (or more). monday.com is extremely popular with teams that are not technically oriented due to its ease of use and its features and capabilities that provide alternatives to spreadsheets, whiteboards, and frequent (and excessively long) meetings. More than half of its 35,000 paying teams fall into the non-technical category. What tech and non-tech teams like best about this team management tool is the way in which it connects people to processes. monday.com empowers its users, promotes transparency and team collaboration, and boosts collective productivity. Waypoints is a free library of programming tools you can download and put to immediate use. It is an especially valuable resource to have if you are looking for an efficient and effective way to incorporate various useful features into your apps or web pages. Scrolling animations, sticky elements, and other recent design trends are quite popular and they can create challenges for programmers who do not yet have the tools to incorporated them into their programs. Waypoint’s Shortcut section provides the scripts for these design trends and others. These scripts can be packaged into ready-made extensions. Waypoints gives you an effective way to trigger a function of interest when you’ve scrolled to an element on a layout or page. Have you tried these essential WordPress tools & services? WordPress is seen as the ultimate website building platform for a reason. Its design team was determined to create a perfect website builder. They wanted to create a builder that allows web designers to tweak and adjust their sites any way they want. Thanks to WordPress, users do not have to work around restrictions or limitations. It’s not simply the WordPress building platform that can make life easy for a typical designer. It’s also the tools and services that are either compatible with WordPress. Some of them have been specifically created for use with it. It’s the growing number of these tools and services that makes life exciting for designers. It does so by giving them the ability to continually advance the art of building a better website. This article presents 10 of the top WordPress tools and services. Elementor is an excellent example of the thinking that led to the creation of WordPress: open source, developer oriented and created with the best coding standards in mind. Its creators’ goal was to produce a tool that would let you build anything you want, without restrictions and without coding. The degree to which they’ve succeeded can be measured in terms of its popularity. Starting with a handful of users when first released two years ago, this free, open source page builder now boasts a user base of over 1 million active installs – a major milestone that has never been achieved. The Elementor live frontend editor enables its users to create stunning websites, while offering a super-fast experience and workflow. It also works with any theme or template. You can build a website from scratch, use one of the 130 designer-made templates in Elementor’s library, use your own template, or import a template. Elementors recently introduced series of advanced features and integrations takes website building to a new level. At the same time, its user’s favorite features have either been retained or enhanced. Brizy is another free website builder that will enable you to visually build websites with a minimum of effort. No designer or developer skills are needed to use Brizy, nor is there any need for code. What its users seem to like most is its ease of use combined with its friendly UX. Despite the wealth of tools and options available to designers and developers, Brizy’s user interface is clutter free and free of distractions as well. All the options are right there where you need them. There’s an awful lot of dull, unattractive websites out there that are in dire need of upgrading or total redesign. The owners of those websites are either unaware of the problem or hesitant to ask how much redesign would cost. Web designers would of course welcome the work, even though most would prefer spending their time designing websites from scratch since it would often be quicker, easier, and therefore more lucrative. There’s a difficult, time-consuming way to redesign a website, and there’s also a fast-forward way using pre-built websites that can do the job just as well, and usually better. Be Theme, with its collection of 350+ pre-built websites can show you the way, starting with the following examples. 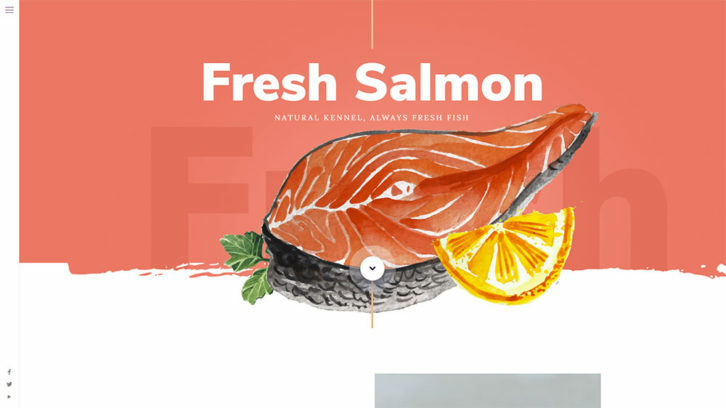 Here are 7 different ways to make an otherwise dull and uninteresting website really sparkle and take on a modern, trendy look and feel. Use Be Theme’s pre-built websites as the fastest way to implement any or all these approaches. When you stop to consider that the average visitor takes about 3 seconds max to decide whether to spend more time browsing a website, a dynamic homepage is one way to convince a visitor to stick around to see what the internal pages offer. It’s important to place dynamic images, videos, or animations above the fold as shown in the 3 following examples or they may never be seen. If your choice is a video, be sure to place the Play button front and center or at least presented in a way that invites the visitor to click on it. Now that you have a dynamic home page, the next step is to ensure the rest of the visitor’s journey will also be appealing. Refreshing a website’s color scheme is one of the easiest improvements to make and doing so can often create the greatest impact. Not only the look of a website can be improved but its feel can as well. A website featuring a friendly look and feel is always good for business. You might be building a website for your own needs and doing all the work yourself. In this case, you may think there’s no need for a collaboration tool to smooth out your workflow. Still, having one or more extra pairs of eyes looking over your work can be beneficial. It’s a different story for the design and development teams. There, quality communication and collaboration are often obligatory. This is especially if budget overruns and missed deadlines are to be avoided. There’s a host of different collaboration tools available. Some are better than others. But the key is to find one that fits in with whom you intend to collaborate and how you plan to go about doing it. We’ve rounded up several of the best collaboration tools on the market, one of which should be perfect for you. Many tools treat collaboration as an extra, although necessary activity. Your team goes about its business and uses the collaborating tool on an as-needed basis. With Mason, product design, build, deployment and collaboration are managed from a single platform. Mason’s front-end-as-a-service capability offers a better way to build, not only in terms of its drag and drop building-block approach, but also in terms of how easy it makes it for teams to interact and keep all the data and information in one secure place and available on demand. Collaboration couldn’t be easier. Trying to keep up with new technologies is a never-ending story for web designers. One would think that in doing so many if not most of those designers would eventually give up the chase. That seldom happens, however, and for a good reason. There are plenty of amazing tools to cope with these challenges. They are created by other designers out there devoting their time and efforts. to this. If you’re feeling the pressure, it might be time to take stock of your computer tools. Throw out any that appear to have lost their effectiveness! You need to see where any gaps in your ability to take new challenges head-on may be. Then, invest in some of the latest best tools and resources. The tools and resources presented here are designed to streamline your workflow. They can definitely add additional creative spark to your projects. This open source WordPress page builder is lightning fast, developer friendly and works on any theme. Its live frontend editing feature allows you to create stunning websites without any need for coding. Elementor has been a hit from the beginning, amassing a user base of more than 900,000 in less than two year. Elementor 2.0 is the newest version and includes exciting new features like the theme builder. You can use Elementor for free. This page-builder is extremely easy to work with. While its features include a comprehensive library of pre-designed templates, Elementor will work with your own saved templates. You’ll be able to use them again and again and share with others. Form Integrations, the visual form builder, a menu builder and custom CSS are among the most popular features. With most WordPress themes the ability to create mobile-friendly devices is treated as an option, albeit a necessary one, or just another feature. Creating mobile-friendly websites is Mobirise’s specialty. You can build awesome device-friendly websites, small websites, landing pages, or portfolios, all without coding, and without any cost to you. Mobirise is free. There’s a wealth of features and tools to work with too. You’ll find 1,200+ trendy blocks and templates in the package, along with nearly 8,000 fonts and icons and 500,000 free images. Web designers have a full plate when it comes to trying to keep up to date with the latest trends. This is especially true in 2018. These days, several different approaches to web design have surfaced. It takes time to acquaint yourself with each of these trends. This is the time you would rather spend doing actual design work. You can stick to the tried and true and ignore the latest trends. The problem is you run the risk of having the competition leave you in the dust. With each emerging trend, the competitive bar is raised a bit higher. This makes your work that much more difficult. The good news is there is a WordPress theme that has always kept up with the latest creative trends. It incorporated them into its selection of more than 330 professionally-designed pre-built websites. Here are examples of how Be Theme has put 8 recent trends to good use. Custom art is the current rage in website design and is expected to continue to be so for some time to come. Designers and their clients have taken vintage watercolor illustrations to heart. This is due to the feelings of comfort and relaxation they generate. These are coupled with a sense of nostalgia. The use of bold fonts plays an important role. It helps to get a message across without taking anything away from the illustrations. There is much that can be accomplished in the art of creative design. You can experiment with light and shadow. When you’ve achieved the look you want, add smoke to the mix and see what happens. Typically, your design will take on a completely different look.